* The key to any shot, especially a jump shot is balance, you must have the basketball up to chest level as you begin your jump. * At this point, your Springbak Springsoles will further help your balance by aiding in stopping your momentum as you set your feet to begin your jump. The Springbak Springsoles will also increase your shooting range and give you much more balance and stability when shooting the basketball. * The key to having the basketball at chest level and in control of your hands as you start your leap on a jump shot, is coordination between your footwork and your dribble. 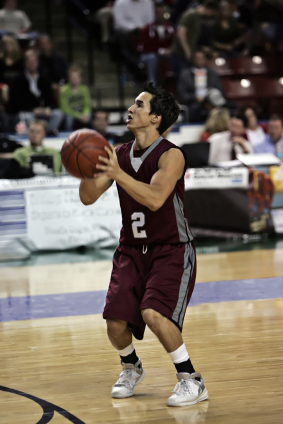 * As you approach a defender before going up for your jump shot, the basketball should hit the floor between strides. Your last dribble before going up for your shot should be a quick, hard dribble in order to get the basketball to your hands as quick as possible. * As the last quick dribble is made, do a skip step with your push-off foot. A skip step means pushing off horizontally close to the floor and simultaneously landing on both feet after pushing off with one foot. With that quick last dribble in mid-stride, the basketball should be in your hands and up to your chest as you land on both feet to begin your jump shot. * This is the key to timing and balance on your jump shot. Have the basketball in your hands at CHEST LEVEL BEFORE YOU LAND ON BOTH FEET TO BEGIN YOUR JUMP SHOT! Before bringing your dribble into your shot approach, hold the ball at chest level while you do your foot work approach. Then take your shot and notice how good your balance is when starting your shot from chest level. * After you get this down, then practice incorporating your dribble into your approach move. Our Springbak Springsoles will aid every step of the way, both in quickness, strength, spring and balance. Enjoy these basketball tips and practice that jump shot.